The fitness of a genotype measures its relative ability to reproduce itself, compared to other genotypes. Fitness shows to what extent a genotype is favored by natural selection. Fitness values are between 0 and 1. The fittest individual has a fitness of 1, and the fitness of the other members of the population can be expressed as 1 - s, where s is the selection coefficient. The fitnesses of different genotypes are among the most important variables - perhaps the most important variables - in the theory of evolution. They determine, to a large extent, which genotypes we can expect to see in the world today. • Measure the relative survival of the genotypes within a generation. Kettlewell's mark-recapture experiment with the peppered moth is an example. • Measure changes in gene frequencies between generations. We then substitute the measurements into the formula that expresses fitness in terms of gene frequencies in successive generations. 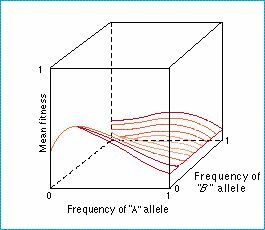 • Measure deviations from the Hardy- Weinberg ratios - this is used in estimating fitness in the case of sickle cell anemia. A measure of mean fitness is commonly applied in population genetics. The idea of a fitness landscape is particularly useful for thinking about complex genetic systems. Figure: a two-peaked fitness surface with local and global maxima.